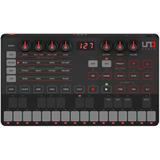 UNO Synth is the first IK Multimedia hardware synthesizer – not to mention our first full-fledged analog synthesizer! As has become tradition, IK products aim to offer a great sounding instrument that is highly affordable, ultra-portable, and can easily integrate into any studio or live setup. We combined our two decades of experience in software and hardware development with the expertise of Italian boutique synth-maker Soundmachines, in collaboration with IK’s synth guru Erik Norlander (one of the brains behind acclaimed synths like the Alesis Andromeda). The result is a no-compromise instrument with massive analog sound that’s also easy to use, with hands-on programmability and advanced features at an unbeatable price. And if you pre-order now you get free shipping! Additionally, UNO Synth is proudly made in IK’s own Italian manufacturing facility to ensure the highest quality standards. Like the majority of IK hardware products, UNO Synth is built using a combination of IK’s state-of-the-art, automated mounting machines and test systems, and fine, renowned Italian craftsmanship.